Monthly - 3rd Thursday at 7:00 P.M.
Eat-in & Take-out tickets are available. **veggie risotto option is gluten-free and vegan. *Please note Santa will be stopping by at 7:00 PM. Bringing back an old tradition also means bringing back an added surprise! We ask that you please bring a wrapped gift (up to $15 value) for each of your own children. Don't let your children see it though! We will sneak it into Santa's bag before he arrives! 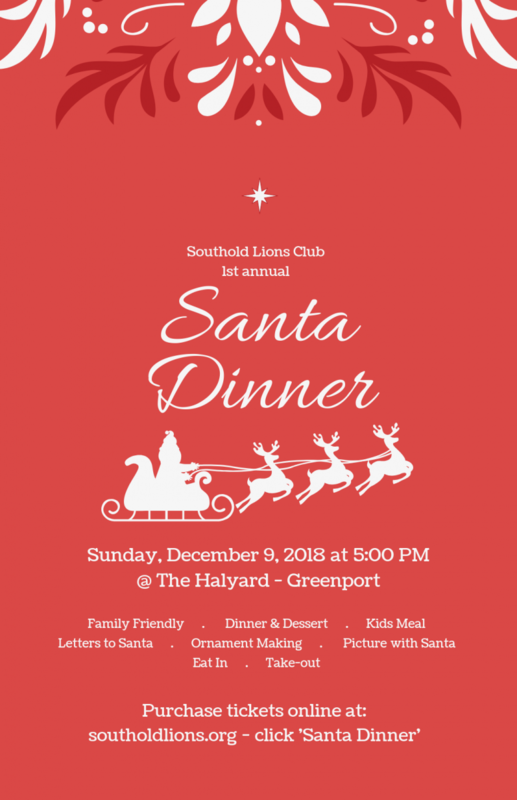 If you would like the Southold Lions Club to purchase an educational surprise gift on your behalf (up to $15 value) and gift wrap it, please add the "Gift from Santa" option to your order & see notes. If you would like to advertise on our Santa Dinner Placemat, click here to download the form.